Texan Jesse Dayton (lead electric guitar) and band members Chris Rhodes (acoustic, electric bass) and Kevin Charney (drums) blew in, tornado style, on their very very long awaited (11 years) return visit to the area. All pumped up he was in the mood to sweep the floor with all-comers when it comes to whole hearted, honest fromhis head to the toe of his scuffed biker boots. Jesse’s knowledge and links with real country music was put to great use as he plucked a few chestnuts from the country tree to go with his own colourful compositions. He was soon dripping sweat and performing like his future depended upon it as he regaled the audience with tales about George Jones back when he lived up to his title of No-Show Jones (due to the lure of alcohol etc), and he even sang a song or two in the fashion of the Jones boy. Without I hasten to add threatening the latter. But, could anyone match Jones’ version of the “Grand Tour”? However, his heart, and he has a big heart iscertainly in the right place, and with the band and himself playing some fantastic music it was a good night for live music & dancing Texas style. 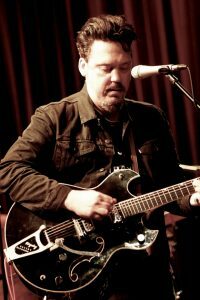 Pulling on over twenty years of recording, Jesse Dayton, had his heart nailed to the mast via the likes of “Well, Daddy Was A Badass”, and “Holy Ghost Rock N Roller” and with a nod to a man he used to play with, Waylon Jennings via the Billy Joe Shaver song “Lonesome On’ry And Mean” we saw a mighty kick propel from the stage. There were many,actually nearly every song worth dwelling upon but in the likes of “3 Pecker Goat”, and in memory of George Jones “Possum Ran Over My Grave”, “Mrs Victoria (Beautiful Thing)” and one that kicked the gig away “Daddy Was……” you had something very special. Oh, and there was an energised version of Townes Van Zandt’s “Loretta” that enjoyed a magic of its very own. With one major song following another,& non-finer than a bolt of lightning piece “I’m At Home Getting’ Hammered (While She’s Out Getting’ Nailed)”. There isn’t much he hasn’t given his attention to and been better than good at . So good was Dayton’s hot-to-go guitar work, come the night’s encore he played some of the finest licks on his guitar after we thought we had heard him at his very best! It wasn’t only because he slipped in a little of “All Over Now” either! 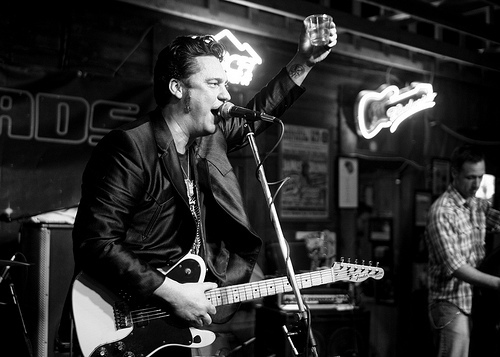 Music for some is simply a livelihood, but with the likes of Jesse Dayton and the boys it’s a way of life. Nothing was held back, as music lovers both on and off stage partied. Give Dayton another Jameson or two and he may well have played all night! Support came in the form of The Sour Mash Trio, and as ever they never let anyone down. Quite the opposite, because they provided a few fireworks of their own. Country and rockabilly walked hand in hand as leader James Stephenson sang his usual array of impassioned drinking songs peppered with other jollities about murder and prison. Pride of place goes to his very own “Drinking And Carrying On” and “Drinking For Two” as ever, they won the approval of a supportive audience. What a Great venue, too!